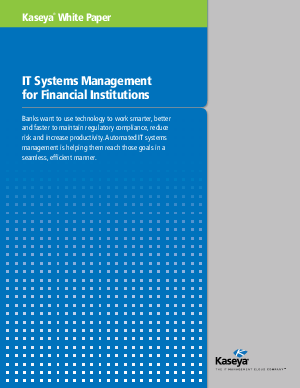 Automated IT systems management, or IT automation – where software manages the routine, day-to-day tasks of IT maintenance – is helping financial institutions of all sizes to work smarter, better and faster to maintain regulatory compliance and reduce risk. And where large banks have been turning to automation for decades, we’re seeing an increasing number of small to midsized institutions taking the same route in the interest of advancing their competitive position with new services. Equipment and software management, for example, consume large amounts of time and resources. In fact, PC management alone is a major cost center for banks and a target for an audit by regulators. As IT team members spend an inordinate amount of time maintaining networks and servers, and managing updates, patches and break-fix issues for end users, they can easily become susceptible to compliance violations and lapses. IT automation delivers relief from the administration, monitoring and helpdesk chores that are the primary culprits for cutting corners and violating security and compliance standards. Regulatory reporting tasks associated with data, communication and security is expected from all financial institutions, regardless of size. In this white paper we’ll look at how one community bank went from a largely manual computer system to one that’s handled in a seamless fashion, along the way reaping additional benefits and rewards from its computer automation initiative.